The next most important thing about our Portland Pudgy is it's durability. When you are a full time cruiser you use your dingy differently than when you are leaving from your home slip and coming back. The dingy becomes a critical part of your day. In the above picture we dragged our dingy up on the rocks and left it there for the day while we hiked to a nearby town. The material the hull is made out of can handle this kind of abuse, unlike our inflatable or our plywood dingy. This is our boat Precipice hard aground in a port called "Les Mechins". The tide went out another two feet from this picture, leaving Precipice nearly high and dry. In order to keep our boat from tipping over and getting damaged (we were surrounded by nice pointy rocks) we ran a halyard from from the top of the mast to each side of the boat tied to two anchors. I rowed the anchor out with the dingy. When my wife handed our 45lb. CQR to me while I was standing in the Pudgy it got dropped. The drop was four feet and landed square in the center of the Pudgy. Pudgy didn't budge. None of our three previous dingy's would have survived this abuse. Also, aside from the inflatable, I wouldn't be standing up in any of them either. It was on this day, when we spent six hours getting our boat out of the clutches of some nasty rocks, that I was completely happy with my purchase of the Pudgy. The floor of the dingy and the bottom of the dingy are bonded together with a two inch layer of closed cell foam. It is incredibly durable. My wife pulling the Pudgy along on the built in wheels. In April I ordered a Portland Pudgy dingy sight unseen. I promised that I would tell everyone how I liked it six months later. Well, here is the beginning of the series two months late. I will say that that the dingy is everything that I hoped with almost all positive results, with a few rather large but easily correctable negatives. I think I will start this series of posts just familiarizing you with the craft and get into the positives and negatives in later posts. The first thing you need to know about the Portland Pudgy is that this is a serious tool meant for serious use. The name is a little whimsical, but this is an expedition level tool built for everyday use and abuse. I really think that the company should market to governmental agencies and explorers for this craft because of it's versatility. I owned, for a short time, a Walker Bay 8. 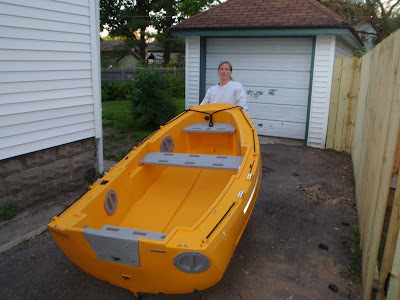 When I was looking to build my own dingy or buy one the Walker Bay is what I was trying to match. Now that I own the Portland Pudgy I realize there can be no comparison. For the type of sailing that I do, I would never consider owning a Walker Bay after using the Portland Pudgy for a season. 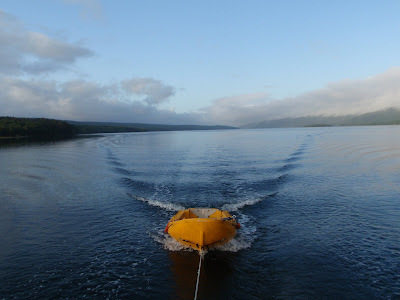 Our boat and our lives depend on our dingy working at any time for any reason. When your wife is dropping a 45 lb CQR four feet down to you, you don't want to be worrying about stability, strength, and tubes full of air. 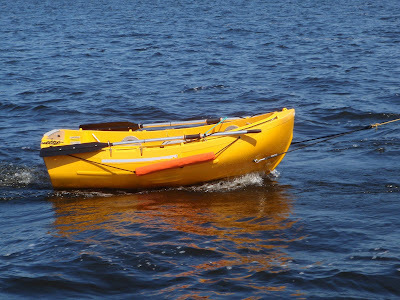 If you are a coastal sailor that uses your dingy once or twice a month, a Walker Bay is a great (if not a little unstable) craft. If you are sailing full time, the Portland Pudgy should be on your short list of craft to check out. Next Up: How I use the Portland Pudgy. Note: If you have been referred here by another site, this is only part of a multipart series. To see the rest of the story click here and start from the bottom. After you are completely sure that you have the precise location for your hole, you get to drill the hole. I was pretty apprehensive about drilling the hole thinking it would be the most difficult job of installing the windvane. The reality was drilling the hole was easy. 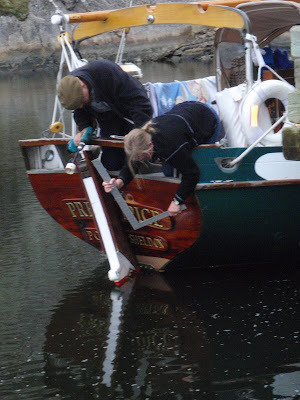 I am sure many people look at the Cape Horn windvane and say to themselves, "I am never drilling a hole that big in my boat", but after I installed the vane I realized I was just being silly. I have four seacocks in my vessel. If I wanted a watermaker I would probably have five. The design of the Cape Horn windvane makes it an integral part of the vessel. The one simple hole allows a extremely strong, yet beautiful matching of the vane to the boat. 1. A high quality (meaning more than 25 USD) hole saw and bit. The bit extender makes your drill/holesaw longer so that you have a better chance of lining things up. I put my level directly on the extender so I knew that my hole was being drilled completely level. 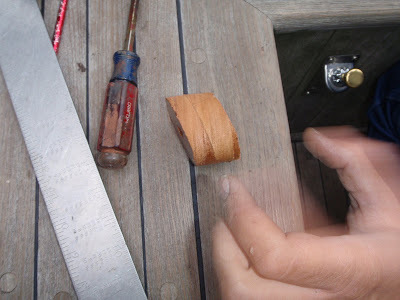 My wife held a square next to the drill and bit, making sure the hole was being drilled exactly in line with the center line of the boat, and my daughter watched us to make sure it looked right and take pictures. We did all of this with the boat in the water. If I had access to a floating dock, I would back up to it and work off the dock. My last choice would be to do this work out of the water. I would be to worried that the boat would be sitting in the stands different than when floating. 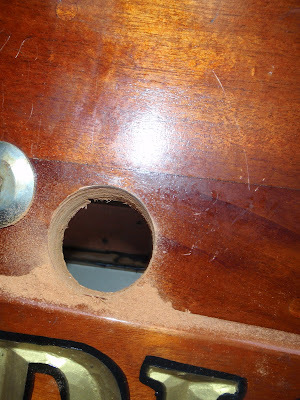 This picture is a picture of a hole saw coming through the inside of the lazarette. The angle of the transom makes the hole go through it at an angle. It would seem like drilling a hole so large through something off angle would be difficult, but the hole drilled very easily and keeping the drill level and square was easy also. Notice that I have things in the stern labelled for help in identifying exactly where everything was going to end up. The completed hole. Notice that the shape of the piece that I drilled out. Again, drilling the hole was easy. If you are worried about installing the windvane as being something difficult, the hardest part is figuring out where it is going to go. Installation was straightforward with the right preparation. Next up, mounting the unit. The installation manual that comes with the Cape Horn windvane is very thorough and is obviously the culmination of years of refinement of what people need to install a complex piece of equipment like a windvane. The owners manual starts out first with operation of a windvane. I think that this is very important because it would be very easy to install the windvane incorrectly if you don't know how it operates. When you first get the windvane you probably don't have much experience operating one and the one that you have is in pieces. It paid me well to spend about a half hour reading about how my windvane operated, how it was set up, and just spend a little more time seeing how part A relates to part B. Now FINALLY we get to the installation part. 1. Step one of installation is to position the gear. Because you have everything labelled and laid out now, this will be easy. Take the gear, and place it where it will go after you have drilled the hole. Holding the gear in place have someone else move the rudder from lock to lock. Do this with the emergency tiller mounted also. And if you have an in cockpit bilge pump, move that also. Also have someone swing the boom overhead. Make sure that as you hold the mounting tube (the main horizontal tube that on an integrated unit goes through the hull) you hold it parallel to the center line of the boat. 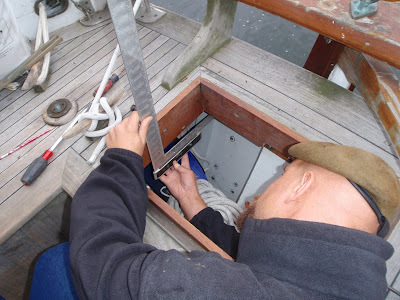 You are trying to make sure that your intended installation location doesn't conflict with your rudder, tiller, steering quadrant, cables, boom, mizzen mast, bilge pump, emergency tiller, dingy davits, life raft, and man overboard system. Again, this is easy to mess up. 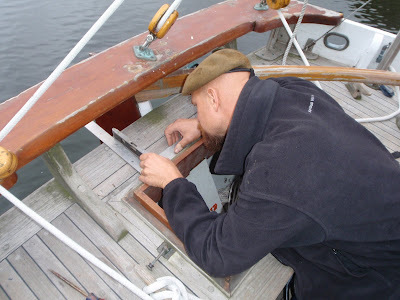 Do the same thing with the windvane quadrant and control rod inside the boat. Move everything to maximum extension. Try to imagine the boat heeled over on it's side. Try to imagine getting things in and out of spaces the windvane will occupy. This may sound like a lot of work, but actually is easy to do if you have everything laid out and labelled. It is much easier now to make corrections, than to have to make major changes in your rig or steering system because you are committed because of a hole in your vessel. This is the same process I go through with any marine gear I install, and it really has nothing to do with the complexity or lack thereof in the Cape Horn gear. The next step is to trace the center of the mounting tube and drill the smallest hole in that spot you can manage (1/8th inch or smaller). Re-check everything you just checked above inside and out. It is easy to plug this hole and put one in a different spot, and you can move at least 1.5 inches in any direction from that hole and still be within the radius of the final space of the mounting tube. Play around. Imagine how everything works. Go out to lunch. Take a nap. Come back and check everything again. At this point you should have a completely solid understanding of how all of this is going to fit together and the spaces each part will occupy in their total operating range. If everything checks out the next step is drilling the mounting tube hole. After laying every part of the windvane out and labeling each part, I started measuring the spot where the windvane was designed to go. This was all done in preparation to build the vane, but now I am making sure the vane was built correctly, and to double check and make sure what Yves and I thought would work a month an a half ago will work now. 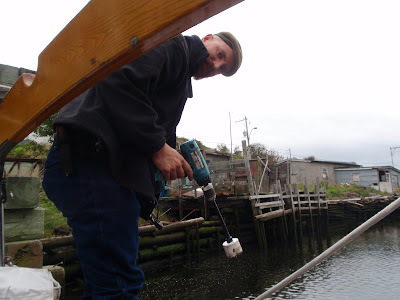 I take drilling a hole in my boat pretty seriously. If I get it wrong, I have to live with it forever. 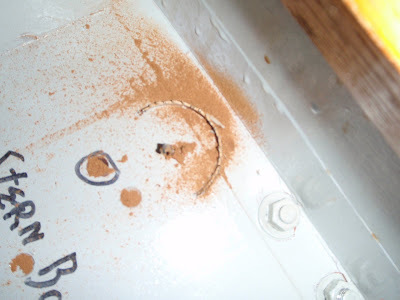 It is extremely easy to drill holes in the wrong place, or find that the hole you drilled goes right through something important. 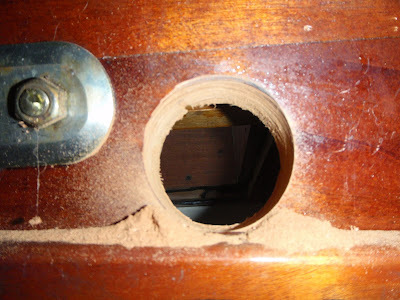 On my installation I found I had to go down about an inch and a half from where we originally thought we could go because the upper board for the transom would have been cut in half and I didn't want to loose that strength. I marked everything with pencil and I marked both sides to make sure I knew EXACTLY where everything would end up. This all may seem obvious, but I have messed things like this up before on other installations. Catch up with us here. Drying our boat out with the tide is always something that we have wanted to try, but because we have no tides in the Great Lakes it hasn't been a possibility. Newfoundland's maximum five foot tide was just right for what we needed. See more pictures here. This is what your windvane looks like when you first receive it. A box of parts. If you ever received an unassembled bicycle as a gift when you were a child, this is very similar. Every part is beautiful. Again, I am going to beat the preparation drum when it comes time to install your windvane. 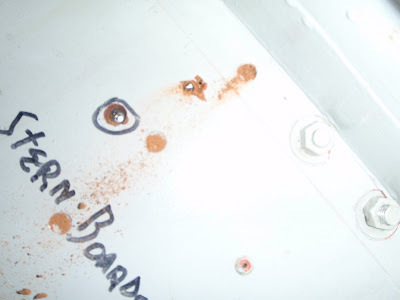 I would suggest taking a marker and labeling each part as it is called in the installation manual so that you know what each part is called before you start assembling and BEFORE you start measuring the boat for drilling holes. It took me an actual 8 hours to install my windvane, and everything went well with no cursing and holes in the wrong place. I know how incredibly stupid I can be during the installation process, but I have found through the years that and hour of prep time saves three hours of installation and setup time of anything I touch. I have heard of people spending a week trying to get a windvane on their boat. A week of ten hour days. Over 60 hours. Stop, slow down, mark, touch, lay the whole thing down on the ground and get familiar with it. Now, before you rush to the drilling holes part. 1. The cape horn gear has many configurations. I was thinking of a much more complex way than what Yves suggested when he came to my boat. 2. The time spend measuring the boat for the equipment probably cut my time in half when it came time to install the equipment. I realize that bringing your boat to Yves, or flying Yves out to your boat is probably not something that is economically feasible, although it is something that Yves will do and the people who do have Yves come out rave about how great a job he does. It is VERY IMPORTANT to realize that prep time spent now in the initial pre build stages define how everything from here out is going to go. Installing the vane is actually easy. 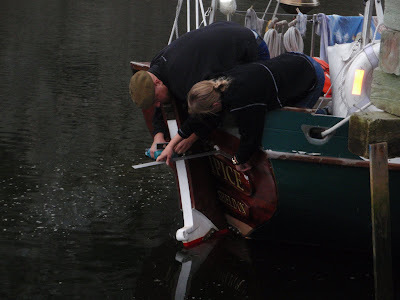 Deciding how the vane is going to mount, and where is the hardest part of getting a windvane on your boat. Slow down, take pictures of your stern, stern lazarette, and rudder and send them to Yves. Send emails back and forth. Make drawings with measurements. Make mock up models out of cardboard shipping tubes. Do whatever it takes to have a rock solid idea of how the windvane is going to mount and what it is going to take to put it on. Do this and the job will go easy. Yves will be patient and encouraging. You will feel like he wants nothing more than for you to have the best working windvane in the world. Which he does. Next up: The windvane arrives. 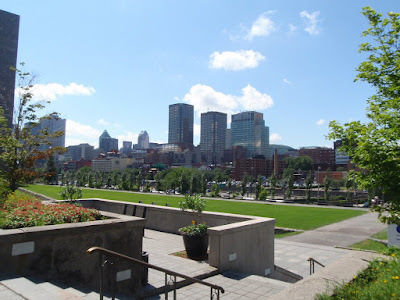 Montreal is a pretty city as far as cities go. In an earlier post I talked about why I decided to trust Yves Gelines. Once I made that decision, I needed to verify if Yves was full of crap or not. Fortunately, I was also trying to nail down my route around the Great Lakes and further. Yves builds the Cape Horn windvane in Oka, Quebec. Oka is in the backyard of Montreal, which is right on the St. Lawrence seaway route out of the Great Lakes. So the main thing that pushed me over the edge between taking the Erie Canal out of the Great Lakes or the St. Lawrence seaway was I could visit Yves. Why not? 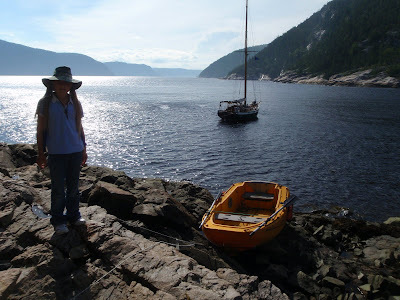 When I got near Montreal I called Cape Horn and they happily agreed to pick me up from the train station near Oka. The embarrassing part of all this is when Yves came to pick me up, I didn't recognize him immediately. He was very gracious and took me to their factory. What I found was a minuscule machine shop dedicated to building one product. Everything was neat and orderly, and everything was geared toward quality. In talking to Yves it became apparent to me that he and his company are dedicated to taking care of the customer, and building a quality vane. I put my hand on the actual product, looked at the windvane installed on his boat, inspected the welds on vanes in progress (beautiful work) and put my eyes on the operation. After 20 years of working in the automotive field and visiting shops all over the continent, I have gotten pretty good at sizing up what is a poorly run low quality and what is top notch. Yves is upper level. The next thing that happened was probably the most important. Yves offered to drive the 45 minutes to my boat and measure it himself. I spent a week with Rachael in New York city to get her Catalina 27 ready to sell, and ready for winter. 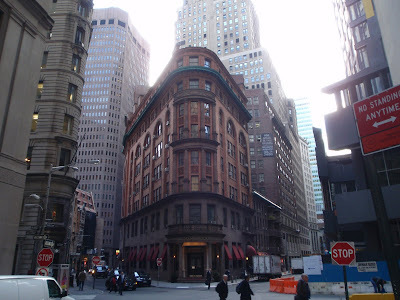 While in NY, I took a drug test, got a physical and updated my emergency first aid/cpr certification. I also sat for my Ham Radio exams. I took the class with Deb and Rachael two and a half years ago, but the night of the test I couldn't make it because I ended up dealing with some unruly customer at work (ahhhhhh, I really miss that!) and never took the test. I took the technicians test and passed with three wrong. The people administering the test said that since I did so well I should take the General test, the next level up. I took it and failed by one question. ( I was guessing on a bunch of them, this is no easy little test like drivers training or something) the group there encouraged me to try again, which I did and I passed by one question. I walked out a happy boy. Note: If you have been referred here by another site, this is only the first part of a multipart series. To see the rest of the story click here and start from the bottom. I spent about ten years researching the windvane question. Next to choosing the boat, choosing a windvane was the the most confusing and time consuming part of the cruising equipment equation. The difficulty of choice was similar to the difficulty of choosing a boat in that windvanes are all equally praised by their owners. Like a boat, each windvane on the market does it's job. Like a boat, each windvane has strengths and weaknesses. Like a boat, everybody that owns one thinks it is the best one made. Like a boat, windvane owners have little experience with other styles of windvanes. Very few boats in the Great Lakes have windvanes, as in I might see one boat a year with a windvane. I did a lot of reading. I purchased books about windvanes. 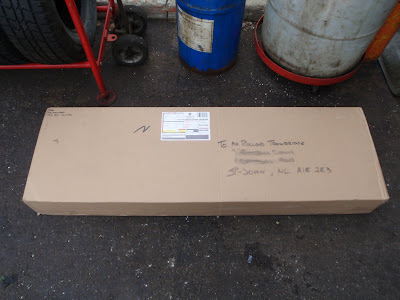 I purchased plans to build windvanes. I tinkered around with sheet to tiller rigging. None of the things I did ever satisfactorily answered the questions I had in my mind about windvanes. In the end, just like the boat, I decided that I was going to have to trust a person. 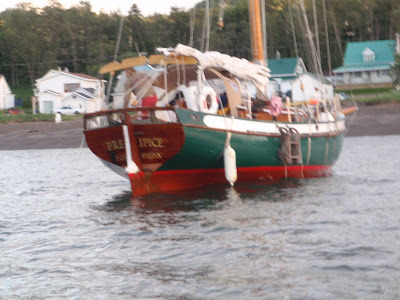 With my choice of boat, I ended up going with Lynn and Larry Pardey (which makes many a sailor roll their eyes, but usually the ones who aren't actually out cruising). With my windvane decision I decided to go with Yves Gelines. We have been at this trip now for half a year. 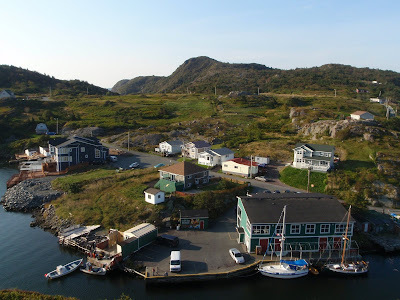 This is our home in Quidi Vidi, Newfoundland. The is about 3100 miles of sailing from where we started. We will winter here, living in the boat and preparing for the next season. The girls are being home schooled by Deb. Follow our continuing adventures here.